The doctoral students of the PhD Program in Hispanic and Luso-Brazilian Literatures and Languages at the Graduate Center of the City University of New York invite you to submit abstracts for the XXII Congreso de estudiantes. The abstracts (250 words) should be sent to congreso.hlbll.gc.cuny@gmail.com by February 6, 2017. In the body of the email, please include your name, contact information, academic affiliation, and any needed audiovisual equipment. Presentations are limited to a maximum of 20 minutes and can be presented in Spanish, English, or Portuguese. Lydia Otero (University of Arizona). Autora de La Calle: Spatial Conflicts and Urban Renewal in a Southwest City. Citizenship and Education in the Homework Completion Routine. 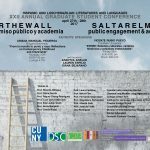 In current debates, the idea of a wall becomes a point of discussion from which to explore the relationship between public engagement and academia. Are the walls that separate intellectual, linguistic, artistic, social, and political practices insurmountable? How do we imagine these metaphors and what forms do they take? Who constructs them and who challenges them? When are they useful and when are they not? How do we cross them? This congress proposes to jump over, perforate, cross, and tear down walls. It invites a transgression of academic hermeticism in order to overcome isolation and promote reflection on intellectual work, its social dimension and its relationship with the public. Through original investigations, we hope to discuss limits and their forms, whether they be self-imposed or constructed, and strategies to overcome these limits. In order to approach these issues, we seek to reflect on the following themes, without limiting ourselves to them.